Santa Marta is a gorgeous city on the Caribbean Sea in the Magdalena Colombia. It has a busy port and was also the first Spanish settlement in Colombia. When in Santa Marta there are multiple trips you can take very easily. The most popular is Tayrona National Natural Park. There are also multi-day guided treks to the Lost City (Teyuna you can join. Lastly, I wouldn't miss Minca if you visit Santa Marta. The jungle in the foothills of the Sierra Nevada are gorgeous and home to beautiful waterfalls and the most Instagram-able hammock in South America. If you're cool with public transport and up for an adventure then take a local bus! The trip takes around 4-5 hours and costs around COP 25,000 - $30,000 per person - around $10. There are multiple departures a day and you can buy tickets at the station or online. First, you'll have to get from the Cartagena city center to Cartagena's bus station. The station is about 8 miles from the old town, and you have two options. The easiest is to take a taxi. Cost is around $15,000-20,000 pesos and take 30 minutes, depending on traffic. When you get in, make sure you confirm the price!!! Many taxis in Cartagena do not have meters. It is possible - and remarkably cheaper (only costs around 1800 COP) - to ride a public bus from the India Catalina monument or Avenida Santander. You'll want to look for a green and white bus with a "Terminal des Transportes" sign. The trip is longer though, it takes about an hour. Once you are in the station, AVOID THE TOUTS, and go straight to the ticket booth. There are a couple of companies running the route with regular departures throughout the day so there's no need to buy a ticket in advance unless you are traveling in high season. Once you are in Santa Marta the bus terminal is about 5 minutes outside the city. You will have to take a short taxi into the city. What is the quickest way to get from Cartagena to Santa Marta? You're going to want to book a shuttle transfer service. 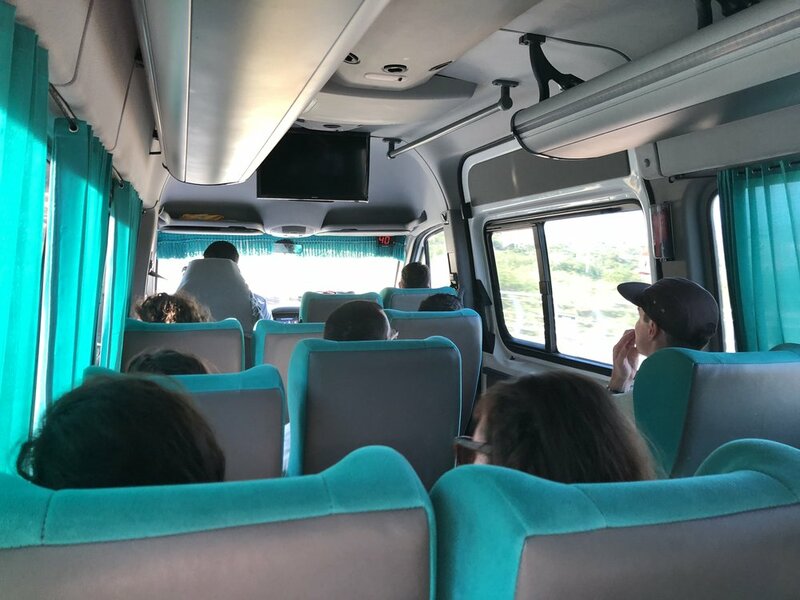 A driver takes a small tourist minibus on the trip for between $19-23 USD. Again, make sure you book your tickets in person the day before your trip (or earlier). If you want to book online ahead of time it will cost you a bit extra. But still - for peace of mind it is only $23. Marsol and Moviliza are the two most well known companies that offer this shuttle service. You can reserve your space in advance and pay in advance. Just click here. Are there flights from Cartagena to Santa Marta? Yes. But they are all connecting flights with layovers. There are no direct flights. It is faster to take ground transportation.